The site comprised a former transport yard, an aluminium finishing facility, car repair facility and scrap yard, totalling an area of approximately 4 hectares. 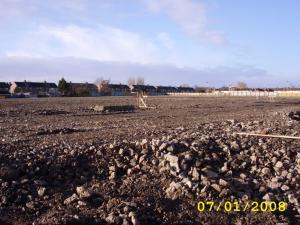 Extensive remediation of soils was required to allow for the development of approximately 200 residential properties. Former onsite activities had resulted in widespread hydrocarbon and cyanide contamination. 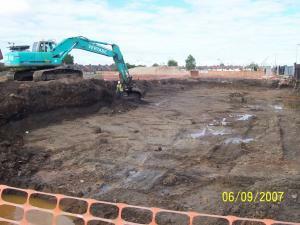 Hydrocarbon contaminated soils suitable for bioremediation were excavated and prepared by screening prior to classification, segregation and construction into biological treatment windrows. All excavated hotspots were validated to the Site Specific Assessment Criteria to ensure the removal of all contamination had occurred. A comprehensive investigation and testing programme was initiated to fully delineate cyanide contamination. This data was analysed and enabled a significant reduction in offsite disposals from the original site investigation estimates. Additional remediation work also included the decommissioning and removal of Underground Storage Tanks, the segregation and disposal of asbestos containing materials and knotweed clearance. VertaseFLI also undertook a cut to fill earthworks operation across the entire site to produce a development profile in line with the developers design. A 200mm capillary break layer was generated on site and placed at the surface in accordance with the remediation strategy. Dewatering of all locations was undertaken across the site and sent to an onsite water treatment facility prior to disposal in accordance with a trade effluent discharge consent. A continual dust, odour, noise and vibration monitoring programme was undertaken throughout the works by a qualified environmental technician. All works were undertaken in accordance with the VertaseFLI Mobile Treatment Licence.